Can you identify any of the workers in this photograph? 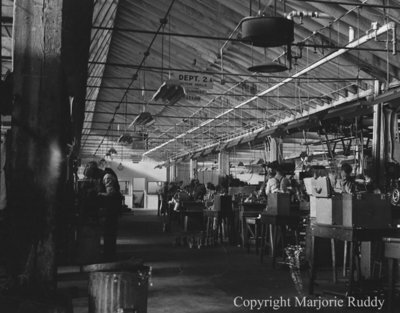 Black and white negative showing inside of a machine shop. Workers are visible working at different machines. The machine shop could possibly be the Whitby Malleable Iron and Brass Company. Machine Shop, c.1940, Marjorie Ruddy. Whitby Archives A2013_040_818R.